Chrysler Brand joins Apple Car Play's list! Thread: Chrysler Brand joins Apple Car Play's list! 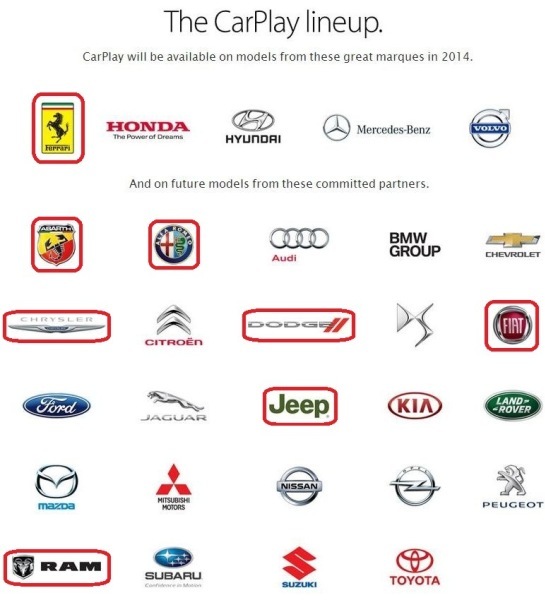 Only a matter of time before Chrysler, Jeep, Dodge, Ram joined apples group in introducing Carplay into future models. Here's the link to read! I hope it stays as good as uConnect is. It's the only system that gets praised by everyone.. I wonder if it will be Chrysler-line only, not the entirety of FCA. uConnect doesn't go away. CarPlay just enables the touchscreen radio to stream the iOS UI from your iPhone (with a slightly modified version to make it easier to use while driving). If you don't want to use it, then you don't have to. It also adds in additional functionality for things like Maps, iMessage (text messaging), and Siri so you can keep your eyes on the road and not reading the touchscreen. Some people think its adds yet something else that keeps your eyes off the road, but its intended to do the exact opposite. Chrysler also is supporting the Android version of CarPlay as well. This doesn't mean you have to choose. Its just an interface that streams from the device to the radio screen. That being said, I'm glad Chrysler got on board. They were really going to miss out on something great if they decided not to do anything while everyone else is. I wish it would be available for my dart when it arrives, but I'm pretty sure they'll make it work with new vehicles when its ready. I know that Ferrari, Fiat, and Alpha Romeo were already on the list of supporters. Last edited by nydartsrt; 07-01-2014 at 12:29 PM. undfeatable and suzq044 like this. ... I wonder if it will be Chrysler-line only, not the entirety of FCA. Why does Ferrari get things we don't? ... I know that Ferrari, Fiat, and Alpha Romeo were already on the list of supporters. I wonder if the Apple CarPlay spell checker will continue to auto-correct the word "Alfa Romeo" ? Because a Ferrari costs 20x more than a Dart does? It also doesn't use the uconnect system Chrysler vehicles do so maybe it was easier to implement into their existing system. That was probably a human error...I spelled Romeo wrong at first too and had to edit my post to spell it correct.